The bright steelhead fly swirled with the current then disappeared as it was swallowed by the frothing white water at the head of the pool. This was the second time this afternoon that I had fished this, one of my favoured April pools. My first casts, about two hours previously, had discovered a silver fish resting in these protective waters. On one retrieve during that earlier time, I had felt the nip of the fish but it ended in a silver flash, an on-off steelhead. I have learned from experience that if a pool is rested after an on-off fish, I recommend at least 30 minutes, that the same fish will take your fly a second time it drifts through. Now, during my second try, I cast the fly in the same waters as before and waited for the line halt as I dead-drifted the fly through the steelhead holt. It was a sudden strike when it came, a solid take with the belly of the sink tip fly line setting the hook. The strike triggered a flashy reaction from the steelhead, a surface dance and leap, then a long run to the tailout of the pool. Our struggle lasted a good ten minutes and then the fish lay over on it's side as I brought it in to the shallow beach waters for a quick release. As I watched the chrome coloured hen steelhead swim back into the depth of the pool I found myself strangely satiated. In the distance Alder brake, the soft whump-whump-whump-whumppppp of a ruffed grouse floated over the singing chuckle of the river. On the beach beside me were the dainty 'V' pointed footprints of a blacktail deer, prominent in the clean receding beach sand and patterned almost reminiscent of a Japanese sand garden. Daily I had watched the river's canopy change, small buds opening to leaves and, the wind sighs now rather than howls as it drifts through the dressing tree boughs. Over the past week I have observed the river water take on a new and exciting deep green, the steelheader's colour, and slowly begin to be clouded with mountainous snow melt. This is my April, my favoured month for winter-run steelhead fly fishing! Of all the months when winter-run steelhead are migrating up native streams to spawn in headwater nurseries, none are more appealing to me than the month of April. It is in April that the west coast is shaking off the last bite of winter. January ice, February cold, and March snow and rain, are now a thing of the past. I have found in April that the warm spring rains veil river colors and give ascending steelhead confidence to travel in shallow waters. It is here in these same shallows that I am at last able to fish my barbless flies effectively. 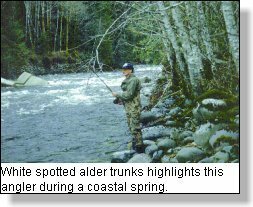 Fortunately, these same rain-warmed waters affect steelhead in such a way that they will readily strike at these flies as they drift through prime holding waters. It is in April that rising temperatures in the stream waters give steelhead, who are poikilothermous or cold blooded, added energy in their battles with my line and reel. 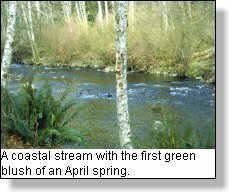 And, it is in April that run-off rivers are full of returning steelhead homing to reach that very special pool where they will spawn. 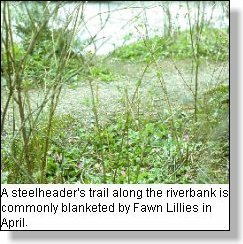 April is the month to steelhead on run-off rivers, not those rivers with a lake as their major headwater source. In coastal run-off rivers, steelhead have evolved to meet the specific river temperatures that occur with melting high mountain snows. Rather than enter the river in the cold winter months they enter with the warming April spring melt. April, like October, is a profusion of color. But, unlike October when life appears ready to hide in order to escape the coming onslaught of winter, April is the month of spring, the month of hope, of energy, and, of pending life. Sprouting life in April is soft, delicate, satiny and tender. Colors are a pastel palette of the full spectrum of green, the favoured color of the active steelheader. It is with the profusion of April wild flowers that Nature provides a very special ingredient for the river angler, the angler naturalist. Walking along river trails, the wild flower the angler first finds are the sadly misaligned Skunk Cabbage. It adds a depth of yellow in a tall coveted stalk. Usually found near tributary marsh areas, beaver ponds or elk meadows, Skunk Cabbage blooms are the true first wild flowers of a Pacific coastal spring. 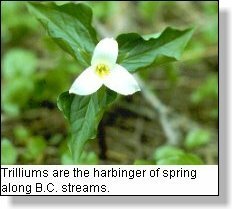 The three sided Trilliums, with striking white flowers, is a close second. At about the same time that the Trillium flourishes, a diminutive yet arresting yellow flower, no larger than a finger nail, blooms, hidden in the duff accumulation of autumn's fallen leaves. 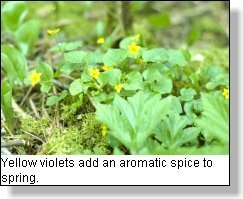 This pansy faced flower, the Yellow Violet, grows in small secretive clumps and is a treasure to behold. As April advances and warm spring weather becomes the norm, Bleeding Hearts with their cupped pink arms and celery leaved stalks fill the forest floor under hemlock, spruce and fir. 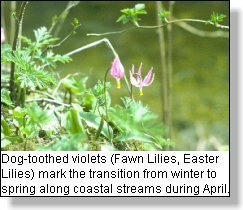 It is also at this time that the striking head-bowed pink Fawn Lilly (Dog-toothed Violet) struggles upwards, then bend on their Shepherd's-hook stalks to open six pink blossom petals and expose a delicate white stem coated with yellow pollen. Finally, along most river trails, the pink blossom blush of the wild red current shrub is strikingly marked against the speckled white trunks of alder trees. April also marks the spring migration and return of many wild birds. Hammering northern flickers, chattering chickadees, whistling finches, honking geese and screaming eagles all add to the ambience of nature's west coast streams. Stepping back from the rushing river sounds, these feathered dinosaurs can be heard adding a never ending song filled with excitement and the hope of a fresh new year. Small animals also appear in more numbers in April. Chattering squirrels, frolicking river otters, low swimming industrious beavers and sleek muskrats and mink, all add their presence to the April experience. Larger mammals like blacktail deer and Roosevelt elk have begun their annual spring vertical migration, a lengthy journey up to high mountain summer pastures following the valley bottoms of the rivers to their webbing watersheds. Wild flowers and wildlife are the harbinger of spring, the season for the fly fisher to angle in run-off rivers! For the observant contemplative angler-naturalist, it has been my experience that April offers so much more than fish!